Cardia: al Fin de Cuentas ¿Qué es? Int J. MorphoL, 25(2):375-380, 2007. Cardia: at the End of the Day, what is it? *MD, PhD. Instructor Professor Department of Morphology, Faculdade de Ciencias Médicas da Santa Casa de Sao Paulo, Sao Paulo (SP), Brazil. MD, **PhD. Adjunct Professor, Department of Morphology, Faculdade de Ciencias Médicas da Santa Casa de Sao Paulo, Sao Paulo (SP), Brazil. ***MD. Instructor Professor, Department of Morphology, Faculdade de Ciencias Médicas da Santa Casa de Sao Paulo, Sao Paulo (SP), Brazil. ****MD, MSc. Instructor Professor, Department of Morphology, Faculdade de Ciencias Médicas da Santa Casa de Sao Paulo, Sao Paulo (SP), Brazil. *****MD, PhD. Assistant Professor, Department of Morphology, Faculdade de Ciencias Médicas da Santa Casa de Sao Paulo, Sao Paulo (SP), Brazil. ******Instructor Professor, Department of Morphology, Faculdade de Ciencias Médicas da Santa Casa de Sao Paulo, Sao Paulo (SP), Brazil. SUMMARY: There is no consensus about the precise definition of what the cardia is. Although this term is often utilized in the medical literature, it takes on a variety of meanings, depending on the context. For histologists and endoscopists, the cardia is a region of the stomach immediately below the gastroesophageal junction. However, the concepts of gastroesophageal junction used by histologists and endoscopists are not the same as used by anatomists. This junction is histologically defined as the abrupt transition from the nonkeratinized stratified squamous epithelium of the esophagus to simple columnar epithelium and corresponds to the endoscopically defined Z-line. Nevertheless, this epithelial change does not occur exactly in the anatomical transition between the esophagus and stomach, but is situated in the esophagus, 1 or 2 cm above the anatomical transition. Surgeons usually use the term cardia as synonymous with lower esophageal sphincter. From a strictly oncological point of view, the cardia is the region that includes the most distal 5 cm of the esophagus and the most proximal 5 cm of the stomach. Thus, it is easy to see that there is no uniform concept of the cardia. The term cardia needs to be revised as a matter of urgency. KEY WORDS: Cardia; Gastroesophageal junction; Lower esophageal sphincter; Gastric mucosa; Terminology. RESUMEN: No existe concenso sobre una definición precisa de lo que es el cardia. Aunque este término es a menudo utilizado en la literatura médica ha tomado una variedad de significados dependiendo del contexto. Para histólogos y endoscopistas, el cardia es una región del estómago inmediatamente bajo la unión gastroesofágica. Sin embargo, los conceptos de unión gastroesofágica usado por éstos es diferente al de los anatomistas. Esta unión es histológicamente definida como la abrupta transición del epitelio escamoso estratificado no queratinizada del esófago, a un epitelio columnar simple y corresponde a lo que endoscópicamente se define como línea Z. Sin embargo, este cambio epitelial no ocurre exactamente en la transición anatómica entre el esófago y el estómago, pero está situado en el esófago, 1 a 2 cm por encima de la transición anatómica. Generalmente, los cirujanos usan el término cardia como sinónimo de esfínter esofágico inferior. Desde un estricto punto de vista oncológico, el cardia es la región que incluye los más distales 5 cm del esófago y los más proximales 5 cm del estómago. Así, es fácil afirmar que no hay un concepto uniforme del cardia. El término necesita ser urgentemente revisado. PALABRAS CLAVE: Cardia; Unión gastroesofágica; Esfínter esofágico inferior; Mucosa gástrica; Terminología. Perfect medical communication depends on the utilization of uniform and precise terms. Without these, interpretation errors and confusion may occur. Among the different fields of medical sciences, Anatomy is distinguished by the high number of terms utilized. Sometimes, different anatomical terms describe the same anatomical structure. Seeking to improve the understanding of such terms, in 1998 the Federative Committee on Anatomical Terminology (FCTA) and the International Federation of Associations of Anatomists (IFAA) proposed their standardization through the International Anatomical Terminology, which is adopted around the world as a reference (SBA, 2001). However, some anatomical terms that are frequently utilized in the medical literature have a variety of meanings, depending on the context. This is the case of the cardia, which is not exactly the same structure for anatomists, histologists, surgeons, oncologists and endoscopists. The great heterogeneity in the conceptualization of the cardia can clearly be seen in this review article. The authors' intent is to draw attention to the urgent need for a precise new definition of the term cardia. The anatomical controversy. For many people, the word "cardia" originated from the Greek kardia (heart) because of the proximity of the gastroesophageal transition to the heart. For other people, however, the word originated from the Latin cardo (door), or even from Cardea (for the Romans, this was the goddess who was the guardian of doors), referring to the initial portion of the stomach ("the door to the stomach") (DiDioetal, 2002). The FCTA and the IFAA consider the cardia (cardia; pars cardiaca) to be a distinct anatomical part of the stomach in the International Anatomical Terminology, but it does not define it (SBA). Nor does it establish its boundaries with the other divisions of the stomach, such as the fundus (fundus gastricus) and body (corpus gastricum), thus making the cardia an abstract structure from an anatomical point of view. The Medical Subject Headings developed by the United States National Library of Medicine (NLM, 2006) defines cardia as "that part of the stomach close to the opening from esophagus into the stomach (cardiac orifice), the esophagogastric junction. Cardia is characterized by the lack of acid-forming cells (gastric parietal cells)". This definition does not elucidate the clear limit of the cardia. Moreover, it proposes that the limit between the cardia and the other regions of the stomach should be histological, thus once again creating difficulty in achieving an anatomical understanding of the cardia. The term cardia is frequently utilized to describe the ostium that connects the lumens of the esophagus and the stomach (Oliveria, 2001) or the outlet of the esophagus into the gastric chamber (Netter, 1996a). There are those who describe the cardia anatomically as "the region around the opening of the esophagus into the stomach" (Drake et al. 2005). These are definitions that indicate the same anatomical region, but describe different structures. While one concept emphasizes the ostium between the esophagus and the stomach, another highlights the region around this ostium. From a strictly anatomical point of view, the ostium and the periostial region are distinct elements and therefore not synonymous. There are those who consider the cardia, from an anatomical point of view, to be the most distal part of the esophagus. According to the conceptualization by Hayward (1961), the cardia is the portion of the esophagus between the insertion of the phrenoesophageal (phrenico-oesophagealis) ligament and anatomical junction of the esophagus and stomach. The histological controversy. The cardia is defined histologically as a narrow circular band at the esophagogastric transition that extends for 5 to 30 mm (Gartner & Hiatt, 1999; Zhang, 2001). It is made up of tubular mucus-producing glands that are known as the cardiac glands and which do not have parietal (or oxyntic) cells for producing hydrochloric acid (Kierszenbaum, 2004). However, it needs to be understood that the histological concept of the esophagogastric transition differs from the anatomical concept, a matter that generates deep confusion. The nonkeratinized stratified squamous epithelium of the esophagus is followed by simple columnar epithelium, at an abrupt transition that histologists have named the esophagogastric junction or transition or the esophagocardiac junction or transition (Gartner & Hiatt; Zhang). This corresponds to the Z-line described by endoscopists (Tolentino et al. 2005). It must be emphasized that the position of the Z-line in adults does not coincide exactly with the anatomical transition between the esophagus and the stomach, but is situated above this region, close to the esophageal hiatus of the diaphragm (hiatus oesophageus) (Fig. 1) (Netter, 1996a; Akiba, 1997; Tolentino et al.). One possible explanation for this phenomenon was given by DeMeester & DeMeester (2000). According to these authors, the Z-line would, at birth, have originally been located at the anatomical transition between the esophagus and the stomach. However, chronic physiological exposure of the esophagus to acidic gastric secretions would stimulate metaplasia of the squamous epithelium into the mucus-secreting simple columnar epithelium that is more resistant to acidity. The Z-line would thus gradually shift to a more cranial position in the esophagus, situated 1 or 2 cm above its original position. Fig. 1. Current histological and endoscopic concept of the "cardia" and "esophagogastric junction". Maybe, what histologists describe as the cardia is in reality the most distal part of the esophagus. Probably, there are not three histologically distinct regions of the stomach, but only two: the fundus/body region and the pyloric region. The histological region of the cardia is the fruit of the confusion ofconcepts regarding this topic between anatomy and histology. This thinking is concordant with the conceptualization of DeMeester & DeMeester regarding gastric histology. These authors were categorical in writing in their review paper: "There are no discernible histological differences between gastric mucosa in the fundus or body of the stomach, and the mucosa immediately distal to the anatomic gastroesophageal junction (anatomic). All three sites are characterized by pure oxyntic mucosa". The nomenclature adopted for the esophageal glands (glandulae oesophageae) is another complicating factor in defining the cardia. In the region of the submucosa of the esophagus, groups of small mucus-producing glands have been described: the esophageal glands sensu stricto (or simply esophageal glands) (Fawcett, 1994; Gartner & Hiatt; Kierszenbaum). In the mucosa of the esophagus, glands are found that are similar to those found in the region that histologists call the cardia (cardiac glands), and they have been described in two regions of the organ: one close to the pharynx (between the planes of the cricoid cartilage and the fifth tracheal cartilage) and the other close to the stomach (above the Z-line). These are known as cardioesophageal or cardiac esophageal glands (Fawcett; Gartner & Hiatt; Kierszenbaum) or also superficial glands (Netter, 1996b), and they produce mucus to protect the esophageal epithelium from the gastric acidity (Gartner & Hiatt). However, if the cardia is defined by the International Anatomical Terminology as a distinct anatomical part of the stomach (SB A), it is irrational to attribute the terminology cardioesophageal or cardiac esophageal to those glands situated in the esophagus, even if they are histologically similar to the glands found in the region that histologists call the cardia. This just brings in confusion when trying to comprehend accurately the anatomical significance of the cardia. The endoscopic controversy. It is not possible to clearly define the anatomical transition between the esophagus and the stomach by means of endoscopy of the upper digestive tract (Tolentino et al. ; Richter & Zuccaro, 2006). The criterion utilized for endoscopically defining this anatomical transition is the Z-line (or ora serrata), which corresponds to the abrupt change in color of the esophageal mucosa, going from whitish or pink to reddish. This transition appears as a jagged transversal line and corresponds histologically to the transition from nonkeratinized squamous epithelium to simple columnar epithelium (Macea, 1997; Tolentino et al. ; Richter & Zuccaro). The Z-line is situation in the plane of the esophageal hiatus of the diaphragm (according to endoscopists, at the so-called diaphragmatic pinch), or up to 2 cm above this, in the thoracic esophagus (Akiba; Tolentino et al. ; Richter & Zuccaro). 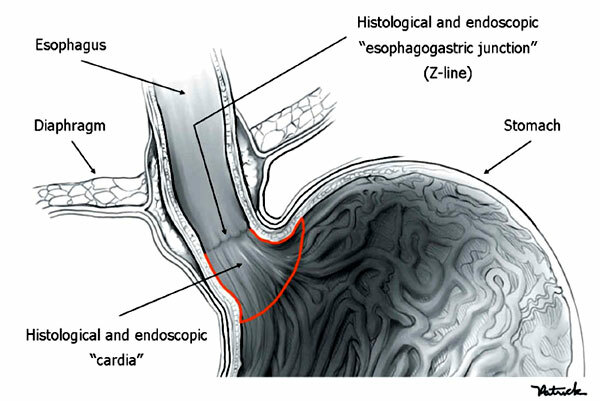 Since endoscopists consider the cardia to be the most proximal region of the stomach, they take the Z-line to be the boundary between the esophagus and the cardia (Figure 1). However, because the Z-line does not correspond to the anatomical transition between the esophagus and the stomach in adults, the endoscopic concept for the cardia is not valid. Moreover, because the Z-line is in the plane of the esophageal hiatus or up to 2 cm above this, and if it is then considered that the organ seen below this line is the stomach, this simply ignores the existence of the abdominal segment of the esophagus, which has a length of approximately 1 to 2 cm (Williams etal, 1989; Albertucci & Ferdinand, 1997). The cardia can also be observed endoscopically by means of a retrovision maneuver in which, when the tip of the endoscope is in the body of the stomach, it is rotated through 180° towards the gastric fundus so as to view the apparatus itself entering the gastric chamber through the cardiac ostium (Tolentino et al.). In this view, the cardia is defined as the region of the stomach around the endoscope, which has an extent of 3 to 4 cm (Falavigna et al. 2006; Tytgat, 2006), even though there are no anatomical grounds for this definition. The surgical controversy. The terms cardia and lower esophageal sphincter are used without distinction by many surgeons (Rodrigues et al., 1997; Peters & DeMeester, 1997), even though these concepts are not the same. Although anatomically there is no sphincter in the esophagus, unlike what indubitably exists in the pylorus (Williams et al. ), manometric studies make it possible to identify two high-pressure regions in the esophagus: one more cranial, close to the pharynx, and the other more caudal, close to the stomach. These regions are known, respectively, as the upper esophageal sphincter (or the pharyngoesophageal or cricopharyngeal sphincter) and lower esophageal sphincter (or gastroesophageal sphincter) (Macea; Gartner & Hiatt; Kierszenbaum). It must be emphasized that these terms are not recognized by the current Anatomical Terminology (SBA). The upper sphincter ranges in length from 3 to 4 cm, and its pressure is, approximately, 100 mmHg. The lower sphincter ranges in length from 2 to 4 cm and its maximum pressure is between 10 and 45 mmHg (Felix, 1997). This is mainly situated in the abdominal portion of the esophagus (pars abdominalis), but extends into a small segment of the thoracic portion (pars thoracica) of the esophagus (Raia & Pollara, 1994). Thus, it needs to be made clear that the lower esophageal sphincter is not an anatomical structure, but rather a functional structure. It is situated in the distal esophagus, and not at the esophageal-gastric transition, as many people imagine. Because surgeons view the cardia as the sphincter, they often inappropriately utilize the terms "cardiomyotomy" and "cardioplasty" to describe the surgical techniques that are used for treating, respectively, achalasia and gastroesophageal reflux disease. «Cardiomyotomy» consists of sectioning the muscle fibers from the most distal 6 cm of the esophagus to the most proximal 3 cm of the stomach. This procedure is certainly myotomy, i.e. sectioning of muscle fibers, but it can never be the sectioning of the cardia alone, which is an anatomical transition plane between the stomach and esophagus, and not a sphincter. "Cardioplasty" is the surgical technique in which the fundus of the stomach is fixed around the distal part of the esophagus, with the aim of increasing the pressure in the region and thus assisting the functioning of the lower esophageal sphincter (Rodrigues et al.). In the understanding taken by surgeons, the term would mean modeling of the lower sphincter but, because the cardia and sphincter are not synonymous, the term therefore remains inappropriate. The oncological controversy. Because of the ambiguous localization of the adenocarcinomas that affect the esophagogastric transition, Siewert et al. (2002) proposed that the tumors in this region should be classified into three categories according to the location of their growth centers: type I: tumors that originate from areas of intestinal metaplasia in the most distal 5 cm of the esophagus and which infiltrate the esophagogastric junction; type II: tumors that originate exactly at the transition between the esophagus and the stomach, which may extend towards the esophagus and stomach; and type III: tumors that originate in the most proximal 5 cm of the stomach and extend towards the esophagogastric junction. Although Siewert et al. designated type II alone as true tumors of the cardia, most oncologists regard all three types as tumors of the cardia (Corley & Kubo, 2004). Thus, from a strictly oncological point of view, the cardia would be the region that included the most distal 5 cm of the esophagus and the most proximal 5 cm of the stomach, a concept that is completely mistaken. The confusion becomes even greater when considering the staging system put forward by the Union Internationale Contre le Cancer (International Union Against Cancer) and the American Joint Committee on Cancer, which is the one most utilized around the world. This system brings the nomenclature "tumor of the cardia" in its classification and gives the guidance that this should be considered in the same way as tumors of the stomach and staged as such (Greene et al., 2002). The concept of the cardia is not the same for anatomists, histologists, surgeons, oncologists and endoscopists. Because of the lack of a common definition for the cardia, terminological confusion ensues, thereby creating complications for scientific communication. The definition for the cardia established by the NLM needs to be revised, and a precise new definition should be provided by the FCTA and the IFAA as a matter of urgency. This work was developed at Department of Morphology, Faculdade de Ciencias Médicas da Santa Casa de Sao Paulo, Sao Paulo (SP), Brazil. Faculdade de Ciencias Médicas da Santa Casa de Sao Paulo.